Dealt with a huge sized and corrupted sql backup file which was showing errors while opening. 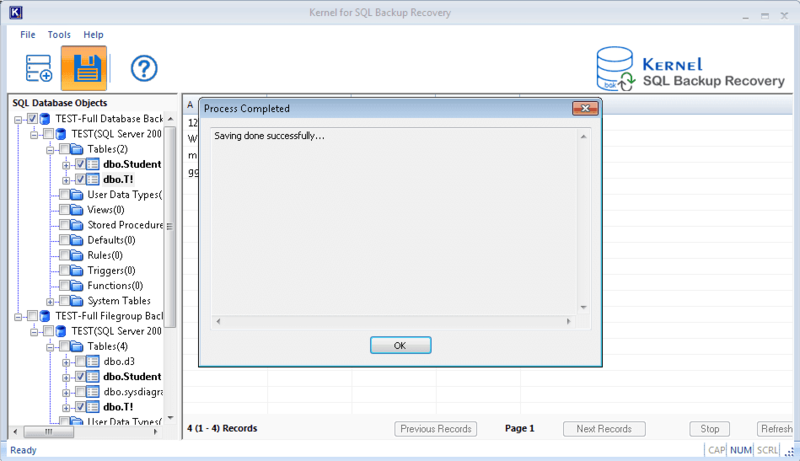 Used this powerful Kernel SQL Backup Recovery software that helped repairing my SQL backup file quite smoothly. Hats off to the developers’ team to build such a user-friendly software! Looking forward to other Kernel brand software. The tool recovers MDF & NDF files form SQL backup (.bak) files. It can recover all the database objects like tables, stored procedures, defaults, rules, triggers, functions, etc. from backup files. 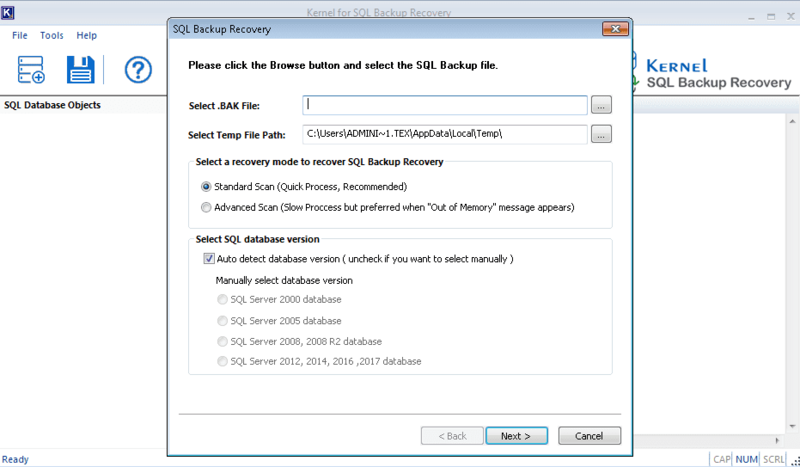 The SQL database backup recovery tool offers recovery of data even from corrupt SQL back up files. It extracts inaccessible SQL data from corrupt backup files and saves to a live SQL Server or batch file. 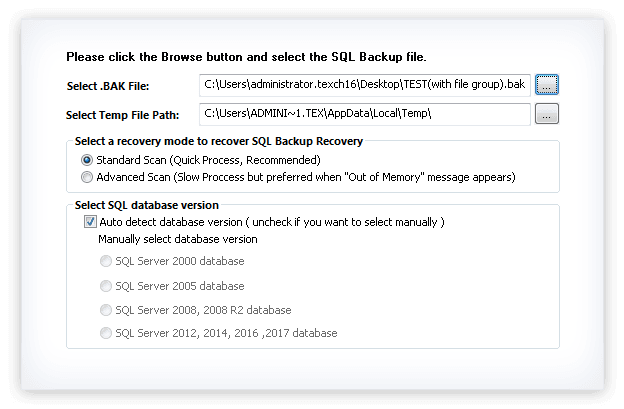 The SQL Backup Recovery tool offers selective recovery of database objects like tables, triggers, etc. You can select the required SQL Backup data in the preview pane to export them selectively to the desired destination. The SQL Server data recovered by the software can be exported to a Live SQL Server. With the SQL login credentials (Windows/Server authentication), you can export the SQL Server backup data to the live SQL Server. The tool also saves SQL backup data to a batch file (by SQL Scripts) at any desired location. This mode does not require a live SQL Server. And this batch file can later be used in an SQL Server. The tool automatically detects the SQL Server Database version. Also, you can select the SQL Server Database version manually. This manual selection option can be used when the SQL Backup file is severely corrupted. 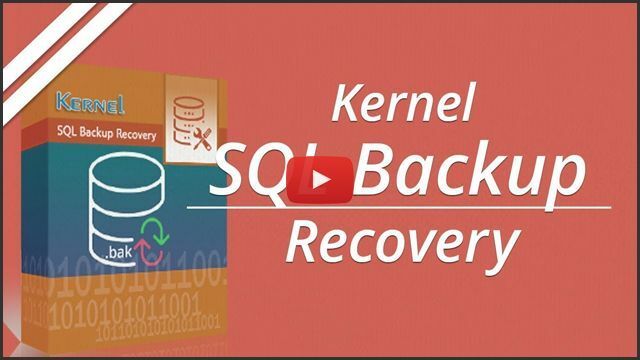 The Kernel tool offers SQL Backup recovery in three steps – select the backup file, preview the SQL data, and save in the desired destination. And non-technical users can also easily use this software. 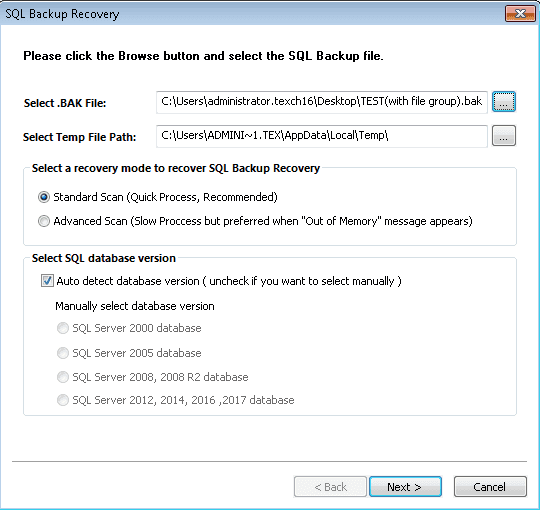 SQL Backup Recovery tool offers a complete preview of SQL database objects like functions, triggers, tables, stored procedures, etc. with all the details. The preview facility is available even in the free version of the tool. 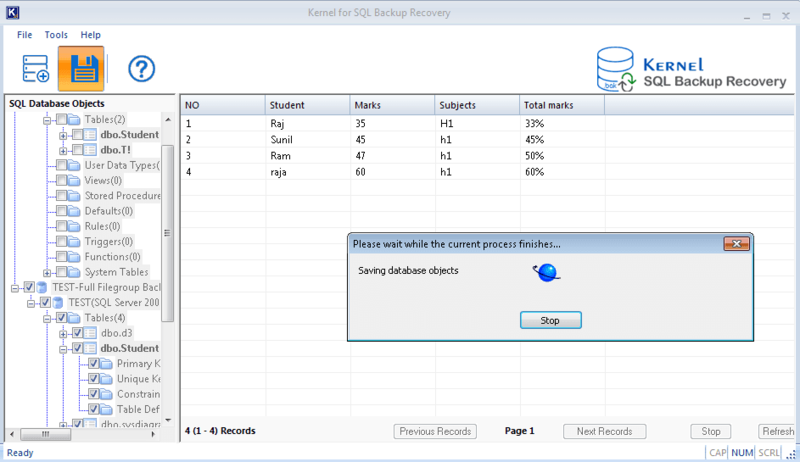 Kernel SQL Backup Recovery tool operation is quite an easy task for any user. Efficient recovery of SQL backup file data is just a matter of few steps with the tool. 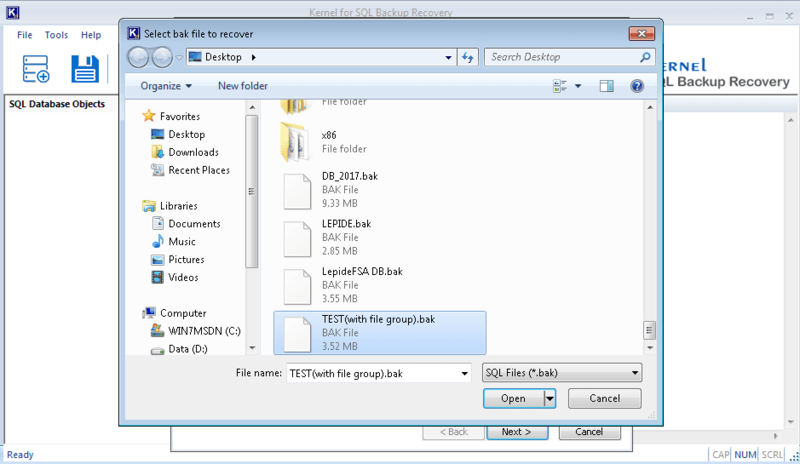 AddAdd the corrupt SQL Backup file for recovery. PreviewPreview the selected SQL database file object data. SaveSave selected SQL Backup database file to the desired destination. 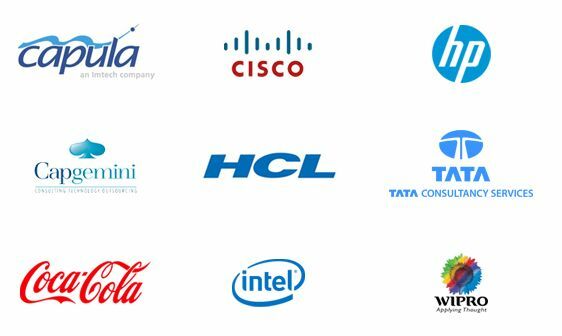 How to restore corrupt SQL data to Live SQL with this software? Launch the software and add the corrupt SQL file. Select the specific scanning method for SQL recovery. Choose the SQL database version or select Autodetect option and click Next. The SQL file folders will be visible in the tool. Select the folders that you want to restore to live SQL and click Next. Choose a saving mod, provide the necessary details, and click OK. The SQL file has been restored to SQL Server. I don’t have SQL Server installed on my system. Can I still Preview my corrupt SQL backup data? Yes, you can. It is not required to have SQL Server installed to Preview the data and to save it in a Batch file. But to save or restore the backup data to a live SQL Server, you should have access to the Server. Can this tool automatically detect the SQL version of files? Yes, it can quickly detect the SQL version of corrupt SQL files. Just check the checkbox Autodetect SQL version. Is it possible to view data of corrupt SQL file after recovery? Yes, you can view entire data of corrupt SQL files after their recovery. Is this tool capable of restoring tables, calendars, and other items of SQL files? You can easily recover every item of corrupt SQL file with this software. With the Free version, you can upload the corrupt/healthy .bak file and preview its objects, but you cannot save it. For export, you need to buy the Full version. Does the tool supports latest SQL Server 2017 version? Yes, the tool supports all SQL Server versions. It is compatible with versions - SQL Server 2017, 2016, 2012, 2008 R2, 2008 and 2005. Does the software integrate an automatic way to identify SQL database version? Yes, it does have the option to detect SQL Server version automatically. However, you can select the SQL database version manually too. I did not face any hardship while using the software and completed the steps on my own. I’m happy with the products as well as the service provided by the Kernel Team. 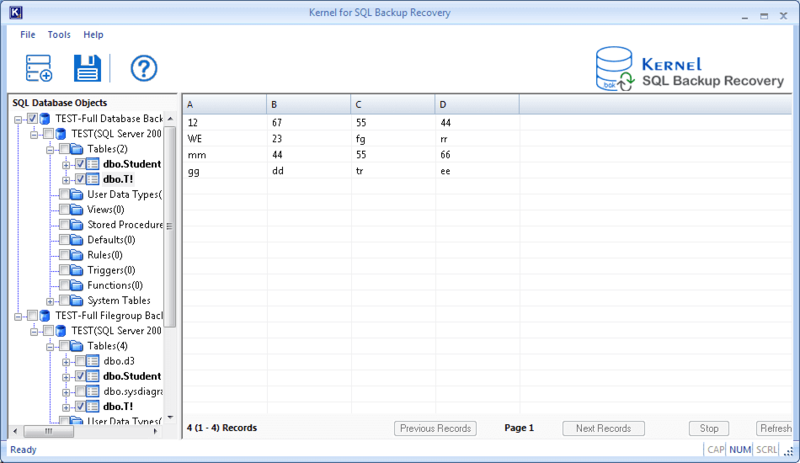 Kernel SQL Backup Recovery tool to recover corrupt/healthy SQL Server backups. Scanning added SQL Server backup file. 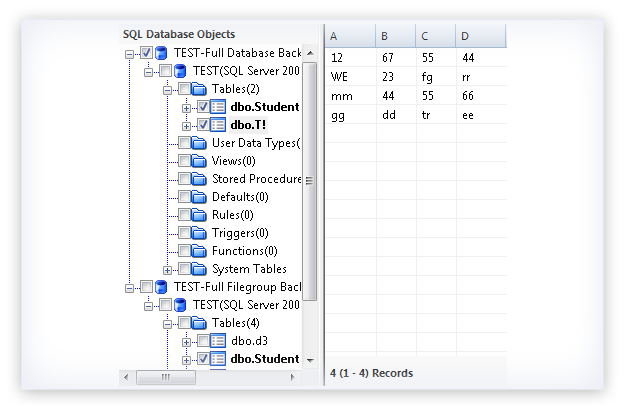 Previewing specified SQL Server database object. 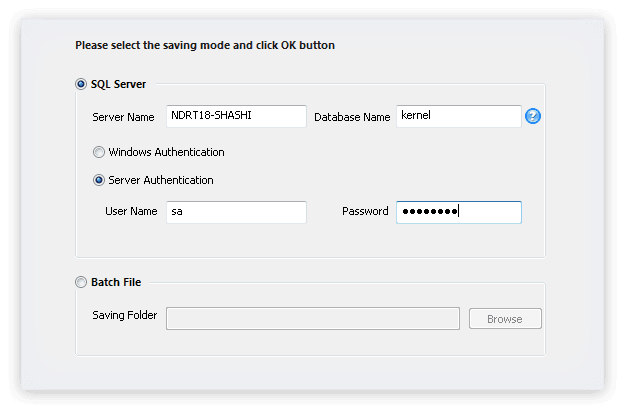 Saving selected SQL Server Database to Live SQL Server. 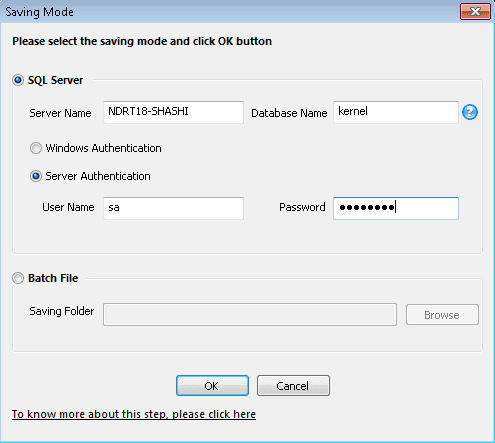 Saving selected SQL Server Database to Batch File. Saving SQL Server backup data to the destination location. Saving SQL Server backup data to the destination is completed.